Jotika 9015 Nelson’s Navy HM Bomb Vessel Granado 1:64 scale wood ship kit! Double plank on bulkhead construction in lime and walnut, complete with pre-cut gunport strip ~ no need to tediously mark on and cut the gunports yourself; 10 turned brass 4pdr cannons complete with wooden carriages; 12 turned brass 0.5pdr swivel guns; 1×13″ and 1×10″ brass mortars; highly detailed brass etched components; profiled brass rails; precision CNC cut and profiled walnut and ply components; all required blocks, black and natural hemp for rigging; 9 fully detailed actual scale plans and two comprehensive step by step colour instruction manuals including technical drawings and constructional photos of the prototype. Twelve bomb vessels, including Granado (the sixth), were built at the outbreak of the War of Jenkins’s Ear in 1739. Granado was ordered on September 14th 1741 and the keel was laid on November 18th 1741. Although it is uncertain who designed the Granado, it is commonly attributed to Thomas Slade, the naval Surveyor who oversaw the construction of the ship at Ipswich. Thomas Slade also went on to design famous ships such as H.M.S. Victory. Granado was unusual in that she was designed to be used as either a sloop or a bomb vessel, being constructed with a conventional square stern. 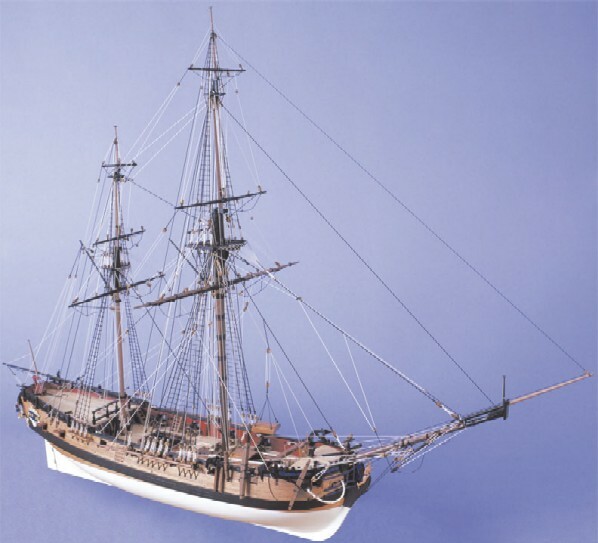 Launched on June 22nd 1742, Granado was taken to Harwich, fitted out and put in commission as a sloop. An Admiralty Order on July 15th 1745 was issued’to fit her (Granado) as a bomb’ but this order was reversed on July 17th 1745 and Granado remained as a sloop. It was not until 1756 that Granado was fitted for the first time as a bomb vessel from an Admiralty Order on July 26th 1756. 1. Two extra 4pdr carriage guns were added (Admiralty order of June 20th 1745) bringing the total 4pdr carriage guns to 10. 2. Two bow chaser gun ports were added allowing accommodation of the extra guns either under the forecastle as bow chasers or at the fifth gunports. 3. The mortars as shown in the Admiralty plans are two 13 inch mortars however when fitted as a bomb vessel this was actually changed to 1 x 13inch and 1 x 10inch mortar. This is confirmed by the provisions list on March 30th 1757 which details 50 large and 50 small shells. Granado remained as a bomb vessel until the Admiralty Order to fit her as a sloop on March 20th 1760. It was during this period as a bomb vessel that Granado was involved in her most active role. On January 22nd 1759 Granado and the squadron under command of Commodore John Moore anchored off Basse Terre. The following morning the citadel and batteries of Basse Terre were bombarded. By January 24th troops had occupied the forts of Basse Terre and Fort Royal, the town had been devastated by fire cuased by the carcasses discharged from the bomb vessels. Granado was again converted to a bomb vessel in August 1761 and she remained as such until she was sold on August 30th 1763 for £575. During this period Granado was involved in the action of capturing Morro Castle and El Morro in the West Indies and the capitualation of Havana on August 13th 1762. Please note that the price of transportation is not included in the price of the kit.